The air is razor-blade-sharp and the trees are seriously contemplating shedding all their clothes and going streaking. It’s absolutely my favorite time of year and I have a special bond with the music of this most fair time. What started in 2009 as a double CD mix of all the autumn tunes in my possession has turned into an obsessive and (probably) lifelong odyssey to anthologize all the songs of autumn. Almost a decade later I’m still at it and this year have two more volumes (12! AND 13!) to release into the wild! Volume 12 is certainly a detour from my usual autumn audio fare and it actually has it’s roots all the way back in 2009 when I unknowingly started this quixotic quest. I had one song back then that I desperately wanted to include but that just didn’t jive with the mood of the more modern tunes that populated those first two mixes. The song was Led Zeppelin’s 1969 tune “Ramble On.” I made the heartbreaking decision to cut it, not knowing that I’d have many more opportunities to include it down the road. Over the passing years I never found the perfect place to slip “Ramble On” into, but I did notice that I was starting to gather quite a few other tunes from the same era. It felt like this year was the perfect time to take a look back at the autumns of the sixties and early seventies. I was fairly surprised to find out JUST HOW AUTUMNAL THE MUSIC SCENE WAS BACK THEN! Especially in the vibrant folk scene of the sixties. You can’t throw a stone into an album of 60’s folk music without hitting ATLEAST one beautiful autumn metaphor or feeling. I suppose it’s only fitting. In a time of so much social change it seems only logical that artists would gravitate to mother nature’s biggest and boldest display of change. How thoroughly steeped in the third season was the music of this era? Well, one band eventually cut out the middle man and just started referring to themselves as “Autumn.” Then they sang about autumnal things. Such devotion naturally must be awarded with opening track status. Jackson Browne’s tune about a walk-a-bout deep in thought (a think-a-bout?) is one of the most quintessentially implicit autumn songs to me. No direct mention of the season but every line is a DeLorean tinkered with by Doc Brown flies me at 88mph to the late Septembers of yesteryear. This is the second version to appear in the Autumn This Year anthology: Gemma Hayes opened Volume 4 with a lovely version. Of course, I realize that Nico’s version is undoubtably the standard bearer but for this particular collection I really love Tom Rush’s folksy meandering take on it. When I get a bit sad during these months it’s helpful to consider that the leaves have done their job. They’ve completed their charge. They’re triumphantly and joyously going home. There once was a man named Yusuf… who once went by the moniker “Cat.” Back in those days he wrote a tiny-flash-in-the-pan ditty that blows a peaceful autumn wind right through me. My playlists often come together when songs pair off together. I like little bits of symmetry like a song called “Catch the Wind” following one called “The Wind.” They are little details that make me extremely happy. I like to think of Volume 12 as a sandwich. The first 7 tracks and the last 7 tracks are a warm folksy variety of bread. In the middle you have a filling mix of pop, rock, and country meats and cheeses. EWG’s overly dramatic ode to lost love in the autumn time is the first of those delicious meats. This ones’s perfect for those introspective grey days that creep up and ruin the beautiful glowing days of autumn. This song and the following Kinks track are my 4 year olds favorites on this mix. That has to mean something significant, though I’m not sure what. 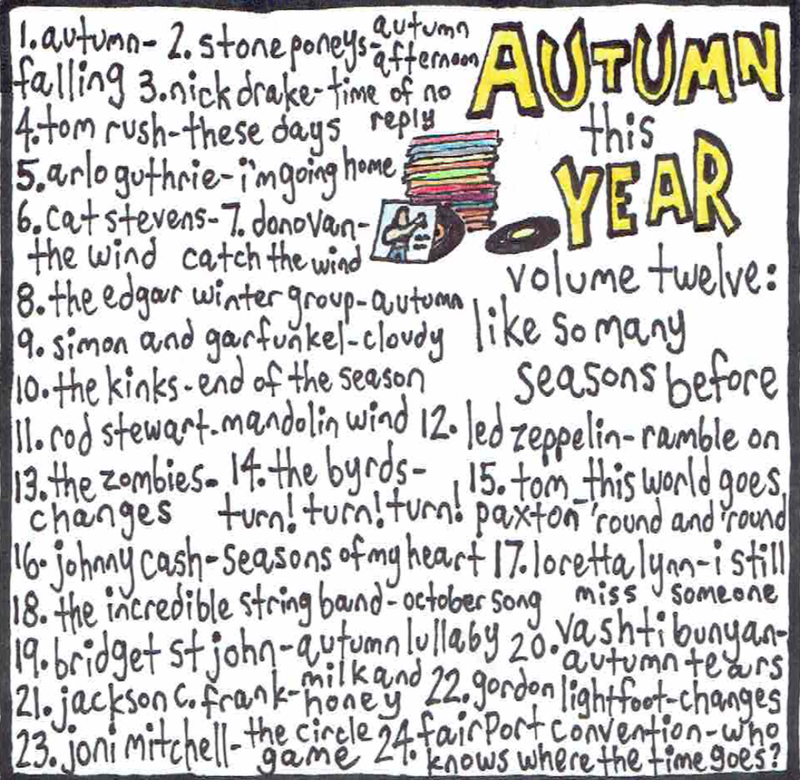 Paul Simon’s other excellent Autumn tune “Leaves that are Green” is featured on Volume 3. The Kinks have one of the most autumn-y tunes ever written… but this is not it! Sha-ZAM! I’m keeping that one in my back pocket for another time and another volume. (Maura Kennedy’s cover of it appeared on Volume 8). “End of the Season” seemed to play nicer with this particular group of songs. Either way, I love how the Kinks are so seriously silly… or silliously serious. As the catalyst for this whole volume, it’s only natural for Zep’s autumnal rambler to sit right smack dab in the middle of the set. It’s got everything in perfect amounts: falling leaves, change, leaving, lost love, and of course a whole verse devoted to subtle Tolkien references. (PS: If you haven’t read some Tolkien in the Autumn you are depriving yourself of beautiful things). A bit of British Psych-pop for added flavor. Break out the conga drums and pan flutes! The quintessential 60’s pop song about change. Of course it’s on this mix. Of course it is. I should be tarred and feathered if it wasn’t. I had to include one of those great fomulaic folksy sing-a-longs full of morality and protest and life lessons. This one hit all those things on the head and has a nice autumn line in the oft’ repeated chorus. Sing along! I also had to swing through a bit of old time country to round out this mix. Johnny was an obvious choice and gets the honor of being the oldest track included. You can find a more world-weary aged incarnation of Mr. Cash on Volume 3. I had never heard of Bridget St John before digging into this era looking for autumn tunes. I was struck by her voice and how much it reminded me of Nico. So if you were sad that I didn’t include Nico’s version of “These Days” you can take some solace in this beautiful lullaby. (ok.. can you tell I feel a little bad about not including Nico… I have trust my gut on this, but I also have to live with myself every damn day until this is remedied… I realize this). A sparse sad track from demo tapes of a teenage Vashti Bunyan in 1964. When this track was finally released decades later the name had been changed to “Autumn Leaves.” However, I’m trusting teenage Vashti who speaks the song’s name at the beginning of the demo. It’s “Autumn Tears” to me. This song is haunting and tragically beautiful. I have to say… I love my Led Zeppelin guys, but I think there is like a 93 to 94% chance that they ripped off Mr. Jackson C. Frank on their version of “Babe I’m Gonna Leave You” four years later… just sayin’. “Changes” seems to be one of those tunes that was passed around to nearly all the folkies of the late sixties. But Gordon Lightfoot is a folkie king amongst men and his voice does it up proper. I consider this track the start of a three song outro of solid folk giants. Oh, Joni… how I love this tune. All together now! Last year’s volume of Autumn this Year ends with a cover of this song so I found it all too fitting to have the original end our trip back in time this year. This song asks the perfect slightly sad autumn question and does it oh so beautifully. Such is everything autumn. Hope you enjoy this autumnal trip back in time. Click the Spotify link to find all the past volumes of Autumn This Year. As with all my mixes feel free to #listenloveshare and support the artists that give the world great tunes. Happy autumning!